Compact Sedans are the new hatchback that the Indian customer demands. With premium hatchback space along with a boot stuck on it, which gives weekend trips an all new meaning and let’s not forget the sub Rs. 10 lakh price tag, which justifies everything, including, safety, style and efficiency in every way. Maruti, being the segment leader, started this whole trend yet again after Tata did it with the Indigo almost a decade ago. 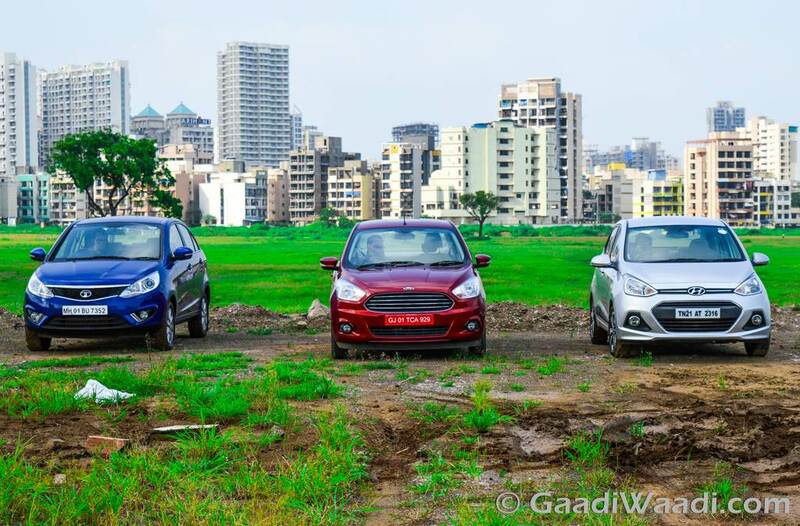 Honda, Hyundai and Tata followed and today, there is Ford. Ford is already known with the Ecosport to creating sub 4-meter vehicles while offering the world inside them. Ford Aspire is here today to fight out against the toughest of the lot. 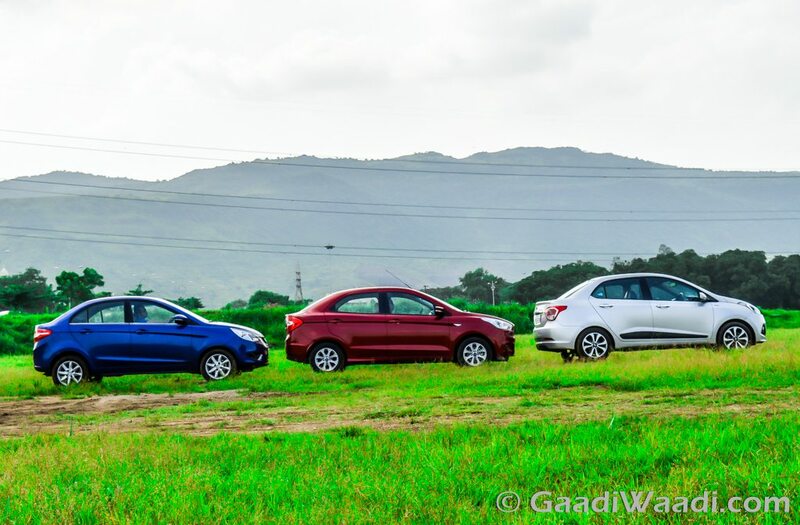 All these cars are the best in the segment. Unfortunately the Amaze and Dzire couldn’t make it, but never mind, it’s a story for a different day. 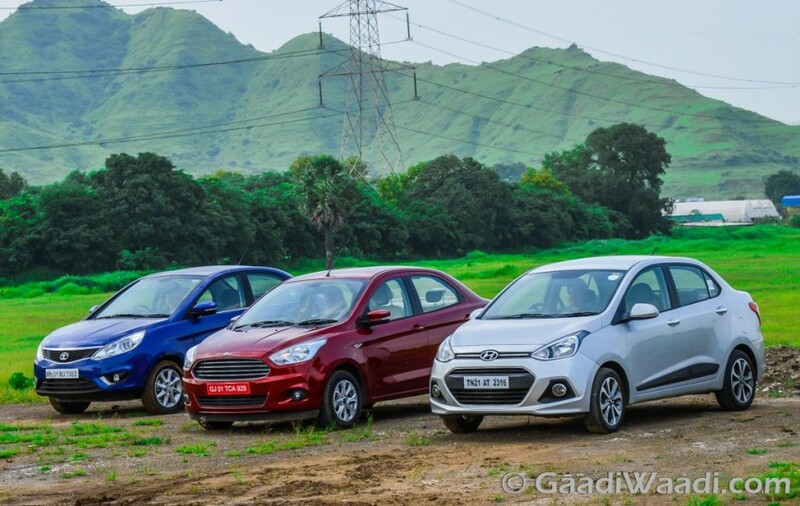 Today we find out if the Ford Aspire has what it takes to beat the tough competition of modern age technology backed four-wheelers! When it comes to styling of these cars all are best of the lot here. However, the Ford with its spectacular looking front end and looks fantastic. Xcent has a bland front end with more of a bumper and less of a grill. Zest with its famous humanity line, and mesh grill still has a lot of character and hold its cards very well in front of the Aspire. Coming to the side, the Zest has tall stance, which isn’t appealing, but the design flows well to the back, which shows a stubby, but it is well-integrated boot. Boot integration is best in the Xcent and so is side profile. However, Aspire looks more substantial and sporty at the side, while the boot looks stubby but in a good way. Overall, then? Aspire is a winner, but the Zest actual has more character than the Xcent, which comes last, but isn’t bad-looking car from any angle.